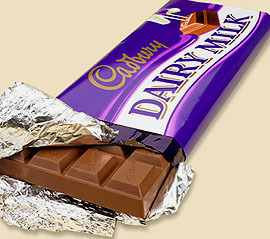 Prior to Kraft going public with its offer on Monday, Cadbury had already rebuffed the advance in private. In publicly rejecting it, Cadbury said the offer, a 31% premium to its closing share price on Friday, “fundamentally undervalues” the company. This is precisely what every company always says whenever someone offers to buy them: even though the offer price is 20% or 30% or 40% higher than the current stock price, it always “fundamentally undervalues” the firm. In other words, corporate CEOs universally reject the efficient market hypothesis, and since Wall Street as a whole seems to agree, that means that essentially the entire finance industry rejects the EMH. So if that’s the case, why should anyone else believe it? POSTSCRIPT: Related trivia: my mother once had a cat named Cadbury. I conducted a blind taste test once of British-made Cadbury’s chocolate and its American-made twin, and everyone involved could taste the difference and preferred the British version. Cadbury Australia has a phenomenal selection of varieties, far more than the pitiful three or four we have in America. The last time I was there in the early 90s, one of the varieties was chocolate with a creamy chocolate filling, and it was great. Sadly, their website suggests it’s no longer made. Sic transit etc. On the other hand, some of the other varieties look well worth a try.